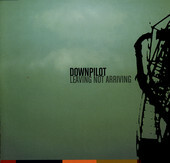 Produced by Tucker Martine (Modest Mouse, Jim White, Jesse Sykes), Seattle-based indie-pop outfit Downpilot's debut, Leaving Not Arriving, which opens with the unforgettable piano-pop masterpiece, "True", tells us that there is a new band on the block to pay attention to. Crafting straight ahead indie-rock alongside more experimental, ambiance-centric pop melodies, and wistful lyricism, Downpilot's debut sounds like a band that has worked together for quite some time, its production leaving not a hair out of place, and the instrumentation so delicately flowing into the next. Seattle has another gem on their hands, the up-and-coming Downpilot. I'll give it a B.